One of the most common yet expensive spaces to design or renovate is the bathroom. This space is moving away from the idea of being a merely functional private zone to a relaxing room. 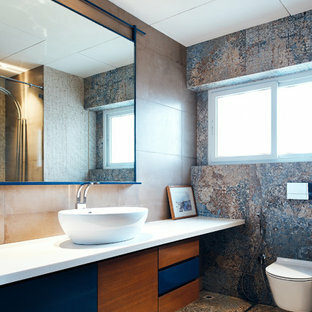 All good bathroom designs start by addressing the layout, colour schemes, and bathroom tiles. 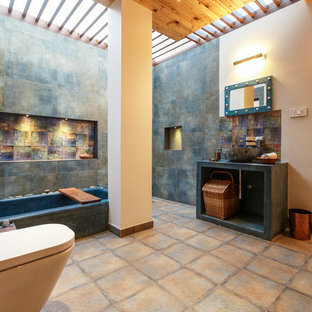 A bathroom design should tie all elements like layout and accessories to suit the overall design. After all, well-done bathrooms add value and comfort to your home. If you’re looking for bathroom ideas, look no further than Houzz Find inspiration from many bathroom images, showcasing various designs and ideas. How do I determine my bathroom design? Bathroom layouts are tricky, so focus on the site and the needs of your family. Start by checking all the pipelines and plumbing. Also, try to use bathroom ideas that fit the existing electric and plumbing points or ensure they can be changed without much effort. Next, think about the other fixed asset placements like the sink, shower cubicle or bathtub, and the toilet. If you have multiple bathrooms, opt for a bathtub only in the master bath. 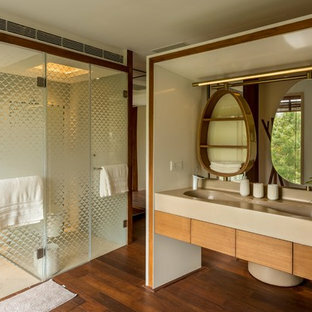 This way you can ensure the other bathroom designs focus on storage.Also, make sure the toilet and shower cubicles are placed at a strategic distance to avoid a wet mess, or install floor-to-ceiling glass screens to create a barrier. Remember, all the bathroom design ideas will center around the needs of your family, so if you have elderly people at home avoid a step at the entrance and always have a wide door. If you have children, think bathtubs. What materials and accessories will enhance my bathroom design? Stone, granite, and mosaic are the top choices for bathrooms because they have a good aesthetic appeal and are easy to maintain. You can achieve many different bathroom ideas with theses finishings. 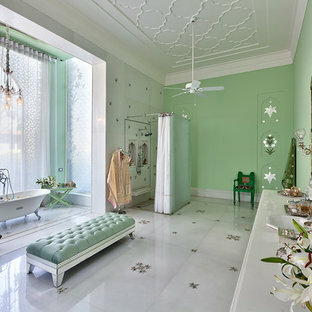 Pick a bathroom colour scheme according to the mood you want this space to set. Dark jewel tones represent luxury while softer pastels will add a lively feel. 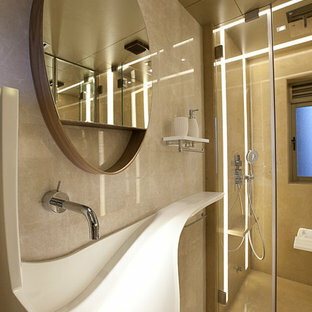 Next, think about lighting, most Indian bathrooms have windows which serve as a source of natural light. If you have windows, think about a bath/ shower room under natural light, if you don’t, add lights to either side to amplify the effect. A bathroom renovation calls for upgrading to new fixtures. 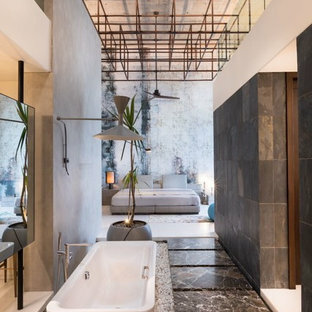 Bathroom fixtures like shower heads, hand showers, multi-way jets and faucets come in a variety of finishes and go a long way in enhancing the look,mood, and experience too. Bathroom furniture is a great way to add storage space. If you are looking for additional storage, adding a bathroom vanity is the way to go. Vanities are available in various sizes like oversized or double. Match the vanity and finishing style to ensure your bathroom interiors match. If you are looking to maximize the space, wall-mounted bathroom cabinets and ladder shelving are also good options. No renovation is complete without adding the finishing touches; in this case the bathroom decor. In this particular room, any element can be used as decor. Add fixtures with finishes that match the style of the design you are trying to create, and coordinate soap dispensers, toothbrush holders and wastebaskets for a cohesive feel. If you have extra counter space, add some artwork or a plant (creeper or Bamboo). Explore bathroom mirror designs to elevate lighting and the overall look of the space. Look through many bathroom photos to get decor ideas that will help you stay in budget. 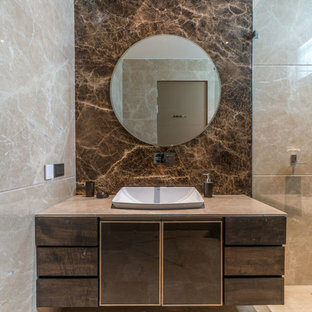 The vanity unit works as space divider between dresser and bathroom areas, and integrates bespoke lighting in brass. Custom his & her washbasins cast in solid surface are held within a free-standing quartz marble frame, which also houses twin egg-shaped mirrors which rotate to provide shelves on the rear side, allowing dual use from the washbasin on one side and the dresser on the other. 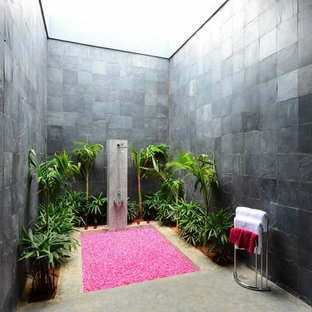 Spa flaunting a rustic look created by Cement wash by Specialists from Pondicherry and Stone wash basin. Master bathroom is unusual from the rest of the house. The design was more personalized. Gloss black, Matte white, warm wood and cement grey texture complimented with brass accessories set a perfect example of rich and sophisticated design. ATPL has provided the latest Palladiom keypads with custom engraving. The keypads control both lighting and shades.